Yaakov Schwartz is The Times of Israel's deputy Jewish World editor. 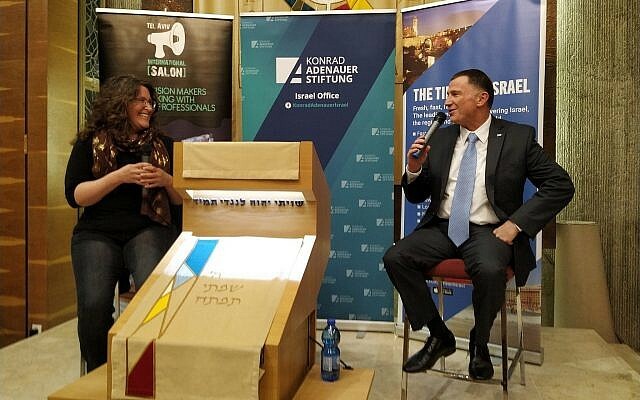 Just minutes before the High Court of Justice granted a petition barring far-right Otzma Yehudit leader Michael Ben Ari from running in the upcoming elections, Edelstein defended the far-right leader’s right to run. At the same time, when questioned about a Likud “embrace” of Kahanists, he was quick to draw a line. 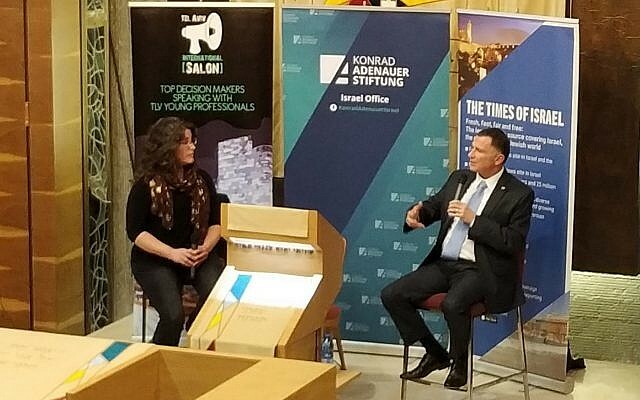 “I have a bad habit of saying quite openly what I think, so if Likud would embrace Kahanists and try to bring them into the party list [via Otzma Yehudit], I would be opposed to it,” Edelstein said. At the same time, he affirmed the party’s right to run. 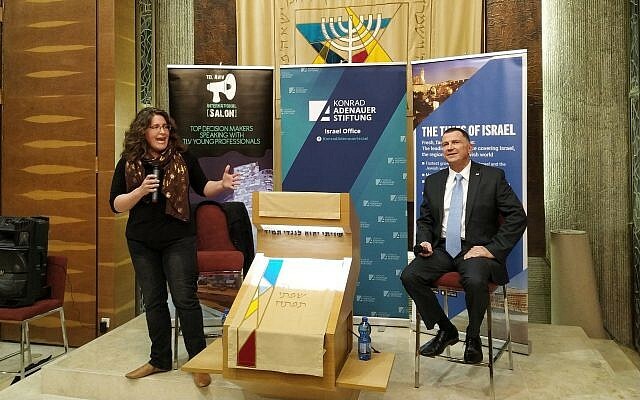 At the same time, Edelstein was unwilling to extend a welcome to other fringe parties. Moments later, event organizer Jay Shultz came to the stage to quietly inform Borschel-Dan that the High Court of Justice had cleared Balad to run in the elections, evoking a smattering of boos. A visibly disappointed Edelstein stopped to address this before responding to the next question. “I didn’t have much doubt that Balad would be approved by the Supreme Court. But at the same time, I do think we have to invest some thought because when Basel Ghattas, a member of Knesset, was smuggling phones to terrorists in prison, he didn’t just hurt the Israeli Knesset by doing that, but he hurt even more the Arabs in this country and the state of coexistence. 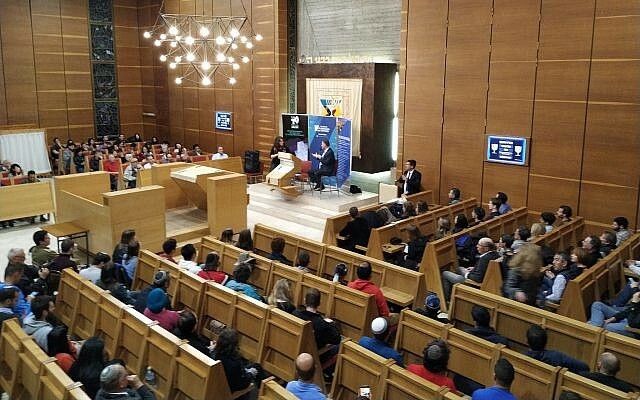 And this is something we have to consider in a serious public discussion,” Edelstein said. Asked about crumbling public faith in democratic institutions such as the Knesset, the police and the military, Edelstein said that most democracies around the world are suffering a lack of confidence from citizens. He cited “the main candidate to become next prime minister of Great Britain,” British Labour Party leader Jeremy Corbyn, who has been accused of allowing anti-Semitism from the far left to flourish under his watch. “So we are in bad shape, as far as democracies around the world,” he said. His advice: Members of the public should get involved.